Courtesy Santa Monica Pub Crawl Holiday crawlers at the Santa Monica Pub Crawl. You’ve walked, donated and volunteered all in the name of charity. Now, here’s your chance to drink for those in need. 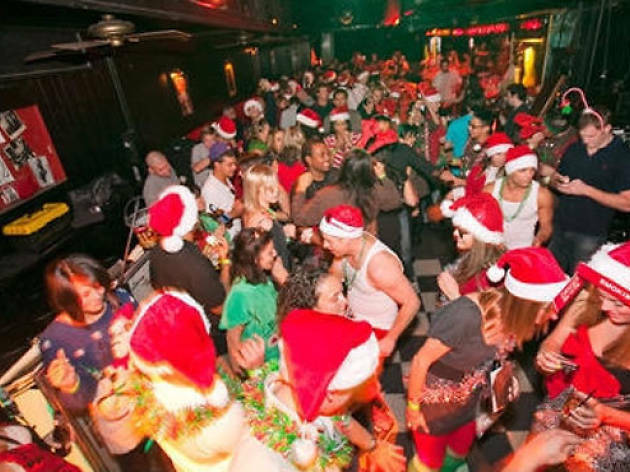 Gather your friends and join other do-gooders at the annual Santa Monica Pub Crawl. A $15 admittance fee ($20 at the door), benefitting the Westside Food Bank, allows you to participate in one of four routes around Santa Monica to experience drink and food specials at some of the city’s best spots, including Finn McCool’s, Ye Olde King’s Head, the Anchor, Barney’s Beanery, Sonny McClean’s and more. Sign up online and collect a wristband on the day of the event (or a week in advance at the Westside Food Bank to avoid lines). Then crawl from spot to spot on foot, hail a Free Ride van or enjoy a discount on the Big Blue Bus where $4 allows you to ride all night long. Dress up in a holiday-themed costume and even take on the Santa Scavenger Challenge Hunt with your friends to earn a prize. Crawlers can download the official “SM Pub Crawl” app for a complete list of bars, routes, specials, map, bus stops and updates.